Outbreaks of H5 or H7 influenza irrespective of pathogenicity must be reported within 24 hours of confirmation to the World Organization for Animal Health (OIE). Outbreaks of low- pathogenicity avian influenza associated with strains other than H5 and H7 can be reported at the end of each year. Within the past two weeks, H5N8 has been detected in turkey breeders in Russia. Taiwan has yet to control H5N1 avian influenza which continues to affect flocks of chickens and ducks. H5N1 avian influenza occurs in India in Bihar State and apparently in other areas. Concurrently H5N1 HPAI is isolated from wild birds in various locations in Bihar State. H5N8 HPAI virus was detected in five cases in the second and third quarters of 2018 involving ostriches in four regions. 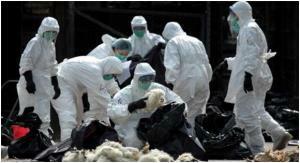 Nigeria has reported H5N8 AI in the central state of Bauchi. A news item posted by an EU website on January 31st noted, “Avian flu returns to commercial poultry in Nigeria and Russia.” It is seriously questioned whether avian influenza ever went away as it appears to be regionally and seasonally endemic in many nations in Eastern Europe, Africa and Asia. Reporting to the OIE is a function of intensity of monitoring, diagnostic capability and transparency.